I hope everyone has a wonderful holiday today. Pictured above is my Thanksgiving dinner from last year. 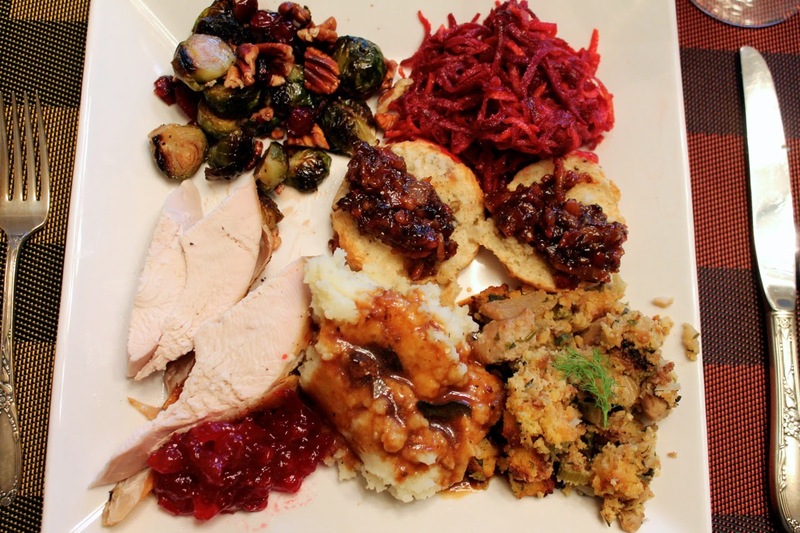 Most of the recipes for the dishes pictured appeared on my site this year (including the turkey, stuffing, Brussels sprouts, biscuits and bacon marmalade). Some of these recipes will look familiar if you've been reading my blog this month, as they've appeared in the last few weeks. Thus, some of the dishes I'm making for Thanksgiving today may appear on my site next year. Put another way, about half the Thanksgiving dishes I write about each year were made the previous year. Although sitting on great recipes for a year isn't easy, it's the best way to make sure I have a good mix of recipes. Plus, sharing Thanksgiving recipes the week after Thanksgiving isn't particularly helpful. I supplement the dishes from the previous year by making other Thanksgiving dishes in October. Below is my menu for today. Come back next year and you'll probably see the recipes for many of these dishes. Wines: Schiefer Blaufränkisch Pala 2011 (Austria) and Henry Fessy Crus du Beaujolais 2011 (France) with thanks to My Poor Liver Podcast for help in selecting great wines.